Kids will enjoy Botanical Gardens and Rose Garden. Step out of Ooty (Udhagamandalam) to go to Gudalur and see Madumalai Wildlife Sanctuary, which is approximately 58 minutes away. And it doesn't end there: take your sightseeing to a higher altitude at Doddabetta Peak, get great views at Shooting Point, and contemplate the waterfront views at Pykara Lake. For traveler tips, where to stay, other places to visit, and other tourist information, you can read our Ooty (Udhagamandalam) trip planner. Hyderabad to Ooty (Udhagamandalam) is an approximately 3.5-hour combination of flight and taxi. You can also drive; or take a bus. Expect slightly colder temperatures when traveling from Hyderabad in May; daily highs in Ooty (Udhagamandalam) reach 40°C and lows reach 28°C. Cap off your sightseeing on the 11th (Sat) early enough to go by car to Mysore District. Mysore District is an administrative district located in the southern part of the state of Karnataka, India. 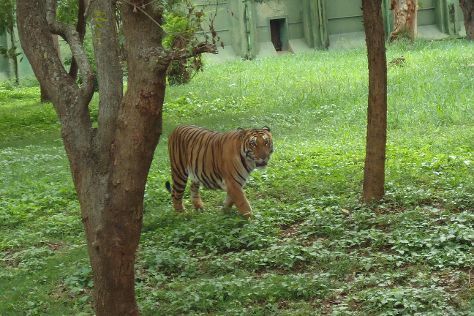 On the 12th (Sun), get to know the resident critters at Sri Chamarajendra Zoological Gardens, contemplate in the serene atmosphere at Jama Masjid, and then admire the local landmark of Brindavan Garden. Keep things going the next day: explore the historical opulence of Mysore Palace (Amba Vilas), then contemplate in the serene atmosphere at Sri Chamundeshwari Temple, then kick your exploration up a notch at Outback Adventures, and finally observe the fascinating underwater world at Planet Earth Aquarium. To find photos, traveler tips, reviews, and more tourist information, use the Mysore District online travel route planner . Getting from Ooty (Udhagamandalam) to Mysore District by car takes about 2 hours. Other options: do a combination of bus and taxi; or do a combination of bus and taxi. Traveling from Ooty (Udhagamandalam) in May, you will find days in Mysore District are a bit cooler (34°C), and nights are about the same (25°C). Wrap up your sightseeing on the 13th (Mon) to allow time to drive to Kodagu (Coorg). On the 14th (Tue), take in nature's colorful creations at Raja's Seat, don't miss a visit to Raja's Tomb ( Gadhige), and then take in the dramatic scenery at Abbi Falls. For other places to visit, photos, ratings, and other tourist information, you can read our Kodagu (Coorg) visit planner . Drive from Mysore District to Kodagu (Coorg) in 2 hours. Alternatively, you can do a combination of taxi and bus. Finish your sightseeing early on the 14th (Tue) so you can travel back home.